Well, here we are again. VCU is one game away from yet another Atlantic 10 finals appearance but will have to defeat cross-town rival Richmond for the third time this season to get there. The Rams dispensed of George Mason in a hard-fought A-10 quarterfinal matchup, defeating the Patriots to complete a 3-0 season sweep and will look to do the same this afternoon against the Spiders, a team that has yet to beat Will Wade as head coach of the Rams. Led by this year’s Atlantic 10 Player of the Year, Richmond defeated GW for the third time this season to advance to today’s matchup with the Rams. The teams traded leads in that one, but when the Spiders need one final stop, they got just that. GW’s Yuta Watanabe had a chance to send Richmond packing but could not get a shot off in the final seconds thanks to a Kwan Fore steal turned fastbreak layup to seal the victory for Richmond. It was the Spiders’ 20th win of the season and fifth straight since losing to VCU on Feb 17. The Spiders have brought a consistent attack to this year’s conference season but have been particularly good on offense where they have led the A-10 with an effective field goal percentage of 55.9%. The Spiders offense can score from anywhere on the court and uses a four-guard lineup that has been nearly impossible to stop this season. Richmond has averaged 73.5 points against VCU this year but have had trouble putting together any type of defense against the Rams, allowing VCU to finish at least 58.5% of their shots inside the previous two contests. The key player to watch for Richmond is no doubt A-10 POY TJ Cline, a crafty 6’9 big who can hit from anywhere on the floor and is one of the best passers in the conference. He’s joined by senior guard ShawnDre’ Jones. An undersized guard with a big game, Jones has averaged 25 points versus VCU this season and has been the Spiders’ most reliable three-point shooter all season long. The third option for the Spiders has been Richmond native and one-time VCU target, De’Monte Buckingham. At 6’4 the Henrico product plays much larger than his size and is somewhat of a Treveon Graham clone. Buck is the Spiders’ second leading rebounder and has the ability to go off for 20 points on any given night. The Spiders have played a short bench this season, going about 6-7 deep this year including in last night’s win that saw five Spiders log 30 or more minutes (versus just one for VCU). The Rams were somewhat of a parallel universe version of themselves last night, struggling to score inside with usually reliable bigs while getting hot from deep in their quarterfinal win over Mason. Mo Alie-Cox was held scoreless and Justin Tillman added just seven points, but the Rams watched freshman De’Riante Jenkins score 15 off the bench while hitting all three of his three-point attempts in the win. VCU would finish 7-14 from distance for an impressive 50% performance from long range despite being one of the worst three-point shooting teams in conference play this year. VCU however brought their typical reliable defense, holding Mason to just 60 points and 38.5% shooting. The Rams mixed man and zone looks to keep Mason off balance and present Richmond one of their biggest challenges today thanks to that defense. Key stat: VCU turned the ball over just 10 times in last night’s win and have averaged just nine turnovers per contest since turning it over 17 times at Richmond. The Rams struggled with turnovers to start the season but have been light years better during the second half of the season. It’s all about defense today. The Rams have found consistent scoring against the Spiders this season but can they find the defense to match? 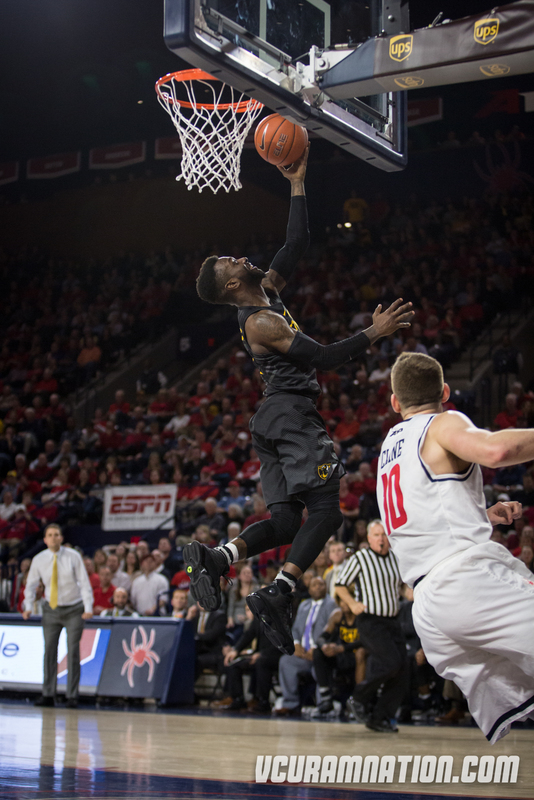 VCU did a solid job defensively against the Spiders in the regular season but it’ll take a championship type of effort on the defensive side of the ball for the Rams to punch their fifth consecutive ticket to an A-10 tournament final. Ditto. The Spiders have to find a way to get stops to win. The Rams have been running a layup line on Richmond since Will Wade took over the black and gold, so the Spiders will need to find a way to limit VCU inside the arc if they plan on playing for an A-10 title on Sunday. Kenpom: 74-69 VCU win with an 67% chance of a Rams victory.